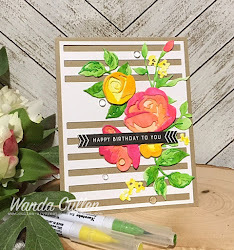 It's a dreary Monday and the laundry pile is being worked on while I am intermittently working on a card for the new Make It Monday Challenge on the Papertrey Ink blog. 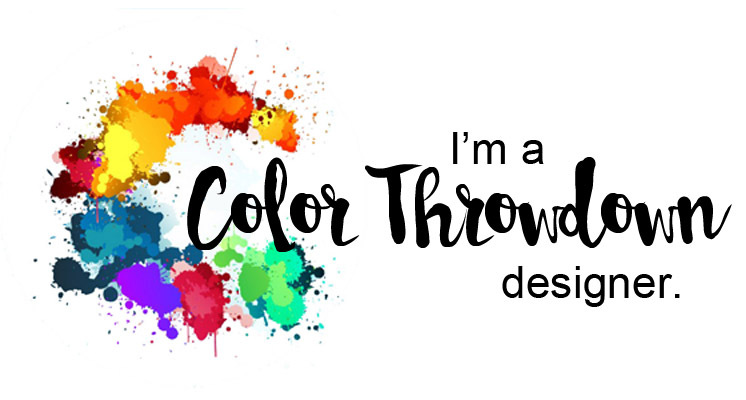 Stephanie Gold is challenging us to create a mixed background texture and has a great tutorial HERE. 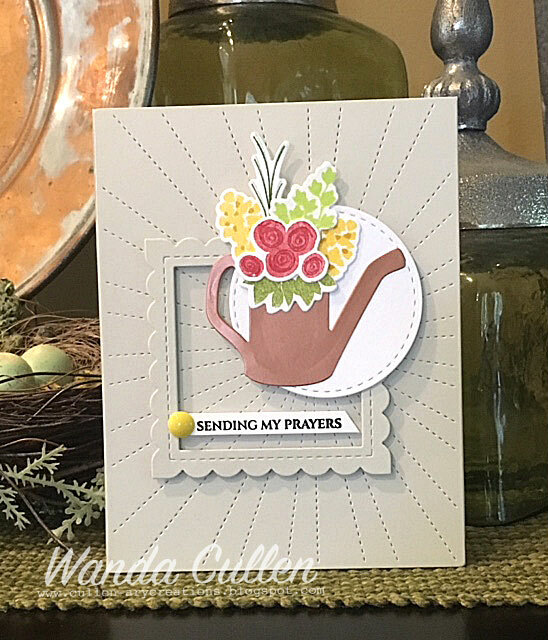 I stamped a floral background using images from PTI's Butterfly Folk stamp set. The sparkle doesn't show in the photo but I sprayed Smooch Spritz over the butterfly. 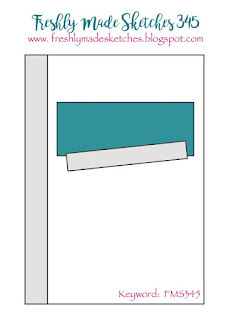 I die cut two tags from PTI's Keep It Simple Frames die set to make the green border. 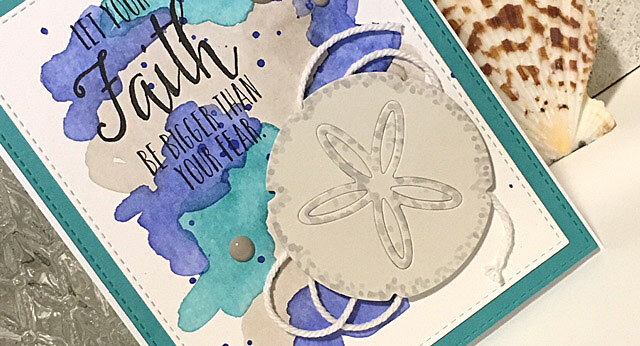 I love the texture that PTI's Quatrefoil cover plate die creates with white on white! 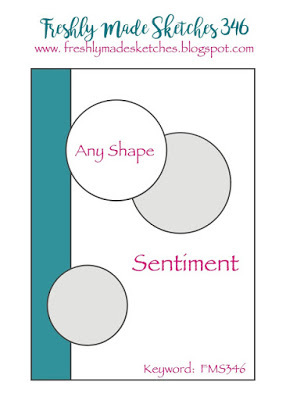 The sentiment is from the Mat Stack 1 Collection by PTI. I'm also entering this into the CAS(E) This Sketch challenge. INK: Raspberry Fizz, Hibiscus Burst, Green Parakeet (PTI); Stone (Reverse Confetti); Versafine Onyx Black. 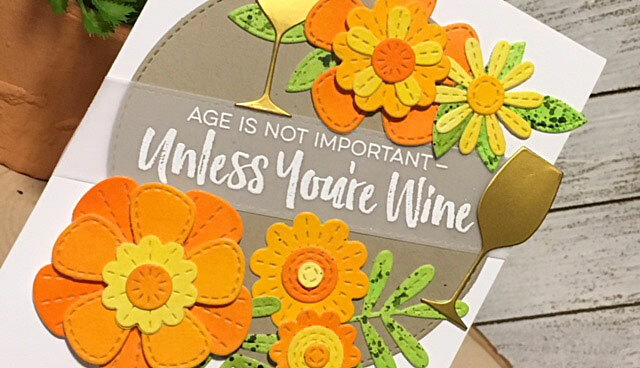 The irony of this card is that I had a beautiful black butterfly sitting on my porch when I went to retrieve a package delivered by UPS! How cool is that?! Playing along with the Freshly Made Sketches challenge - just squeaking in under the deadline! I often go through my leftover pile as I start a new card...with good intentions to use up existing elements. 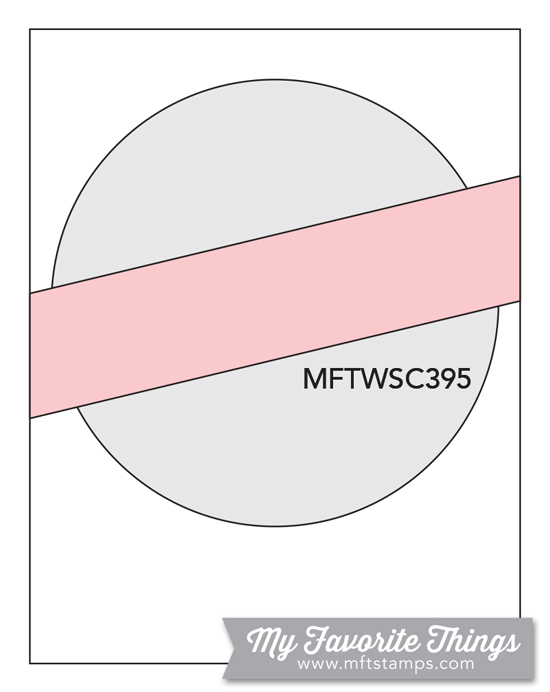 In this case, the stitched circle and the square scallop frame were used. 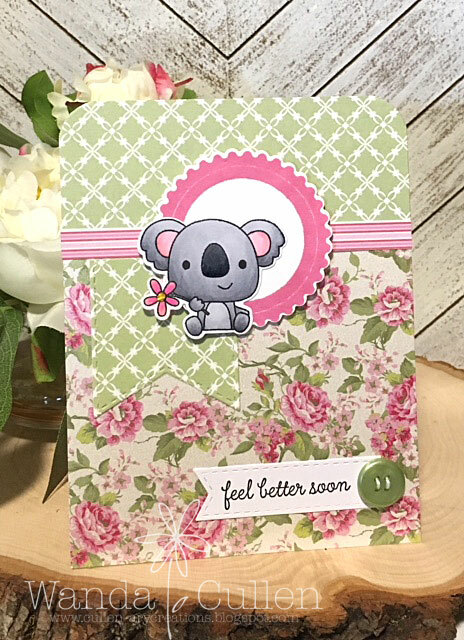 I added a card base in the same stone cardstock and embossed/die cut with this fabulous Stitched Rays cover plate die by Reverse Confetti. I love the subtle texture it adds! 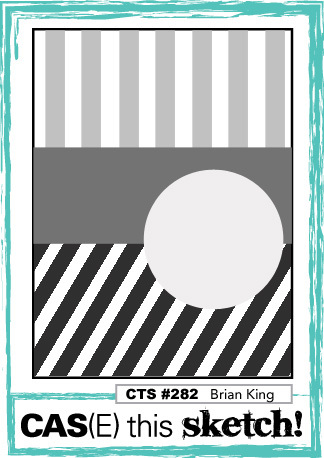 Since I just finished another future card project using WPlus9's Fresh Cut Containers and Simon Says Stamps Let Us Rejoice stamp sets, I went with these same two choices. STAMPS: Fresh Cut Containers (WPlus9), Let Us Rejoice (Simon Says Stamp). PAPER: Stone (Reverse Confetti), White (PTI), Metallic Copper CS. INK: Versafine Onyx Black; Daffodil Delight, Crushed Curry, Lucky Limeade (SU); remaining colors unknown due to being stamped "long time ago". 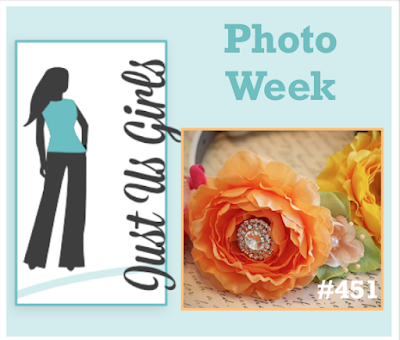 My card was inspired by the Just Us Girls challenge where it's Photo Week and we have this lovely picture to springboard our mojo! 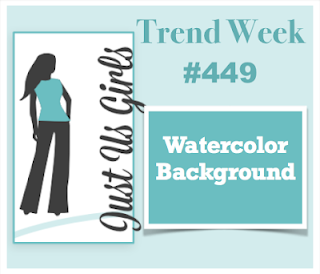 I also used the sketch for this week's MFT Wednesday Sketch Challenge. 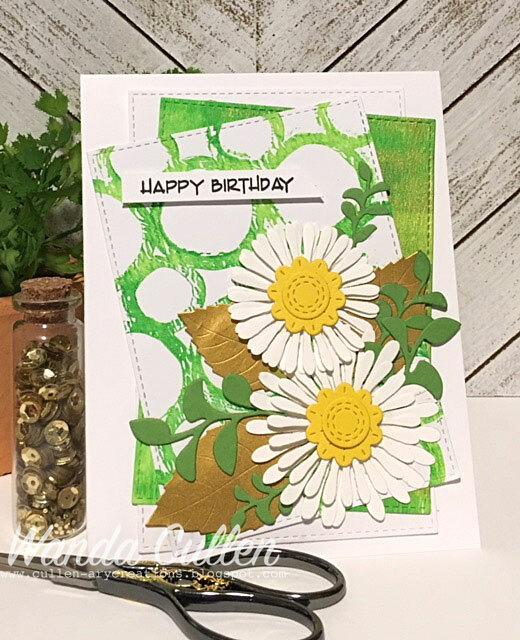 I watercolored the florals using Mijello Mission Gold paints on Ranger water color cardstock. 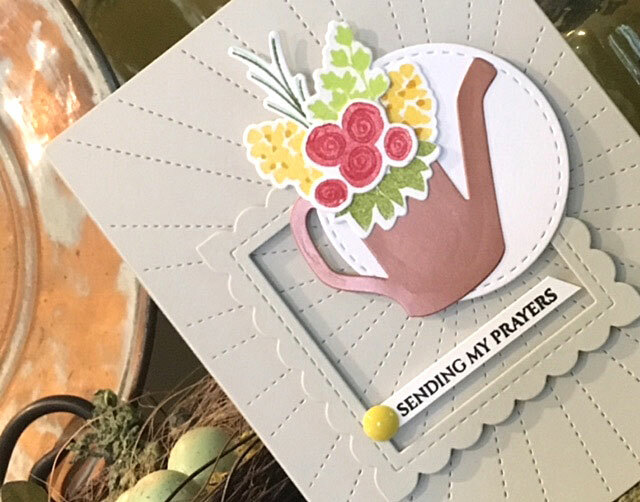 I then die cut using MFT's Stitched Blooms Die-Namics. PAPER: Kraft (PTI), White (PTI), Vellum, Ranger watercolor CS, Metallic gold. 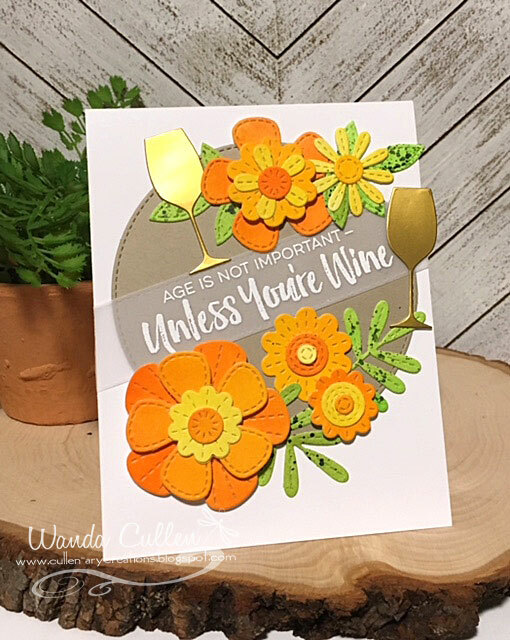 DIES: Wine Service, Stitched Blooms, Stitched Circle STAX - all by My Favorite Things. Hope your weekend is going well. It was a gorgeous sunny day here in Virginia! Happy hump day once again! 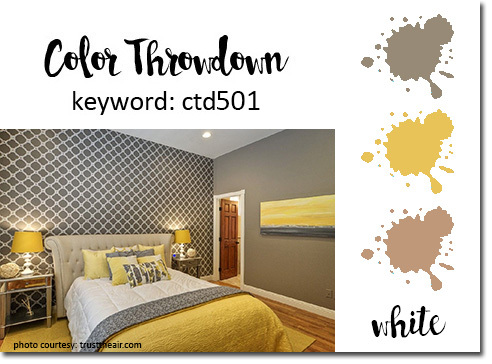 It's time for a new Color Throwdown Challenge and Broni has some great classic colors for us this week! 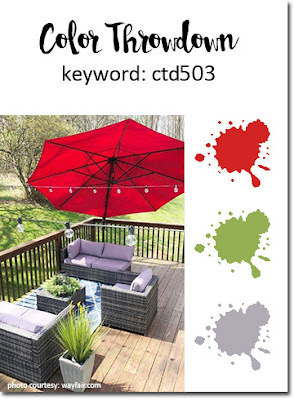 LOVE working with red, green and gray and remember...you can add neutrals if you like! 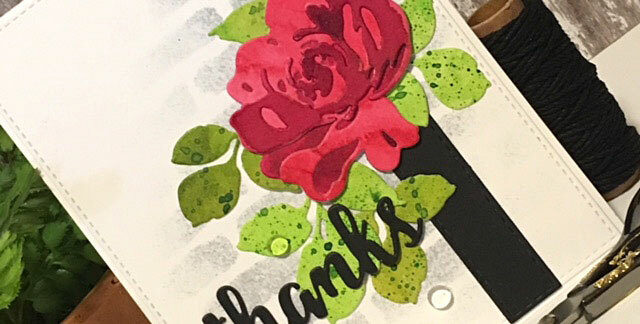 It's been awhile since I've used the Fantasy Floral die set by Altenew and I felt the florals would really pop against a stenciled brick background pattern. 5 1/2" panel, then repeated the process using several shades of green. 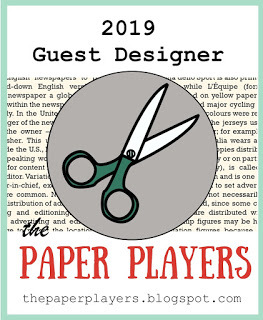 I splattered a darker shade of green over the leaves after they were die cut. 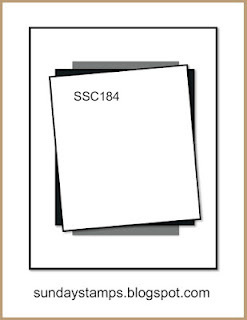 PAPER: Ranger watercolor cardstock; Black Licorice (MFT), Classic Crest Solar White CS. DIES: Fancy Words (Reverse Confetti), Stitched Fishtail Flags STAX Die-Namics (My Favorite Things), Fantasy Floral Die (Altenew). MISC: TCW Mini Bricks stencil; Clear dew drops; Mijello Mission Gold paints. 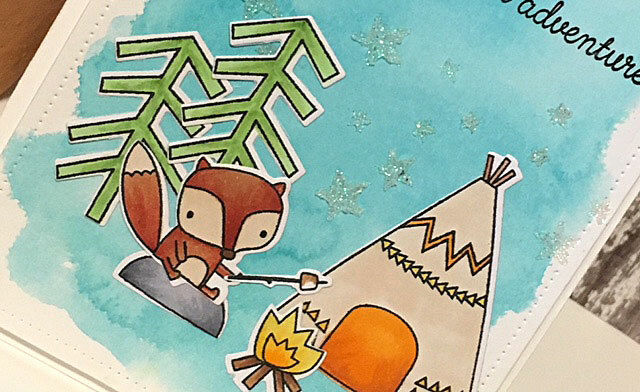 Lizzie Jones has a fun Make It Monday challenge on the Papertrey Ink blog called "Repeating the Greeting"! Check out her video on this post. I knew I wanted to start with the "twig" layer from the Mix and Mat: Plaid Die set and went with Spring Moss CS on top of a Simply Chartreuse CS base. 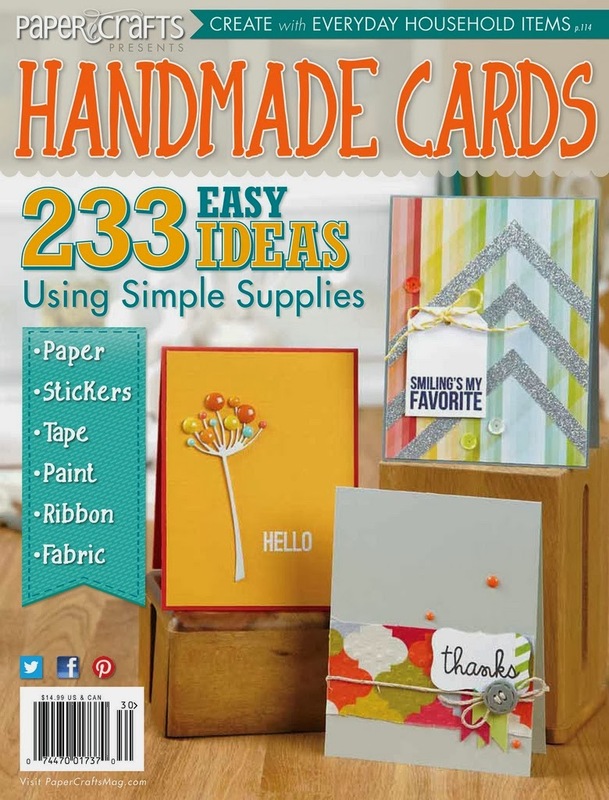 STAMPS: Mums the Word, Infinity Frames Sentiments - PTI. PAPER: White, Spring Moss, Simply Chartreuse - PTI. 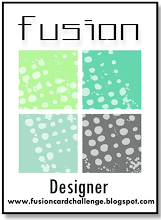 INK: Simply Chartreuse, Bright Buttercup - PTI; Olive - Reverse Confetti; Versafine Onyx Black. 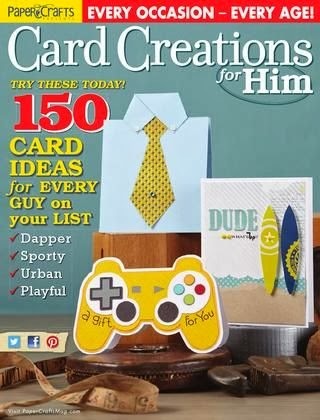 DIES: Mix and Mat: Plaid Die, Mix and Mat: Scallops Die, Mums the Word - PTI. Thanks for stopping by...hope your Monday is off to a great start to your week! 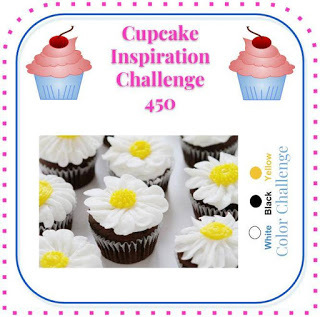 I'm squeaking in under the deadline for the current Freshly Made Sketches challenge! 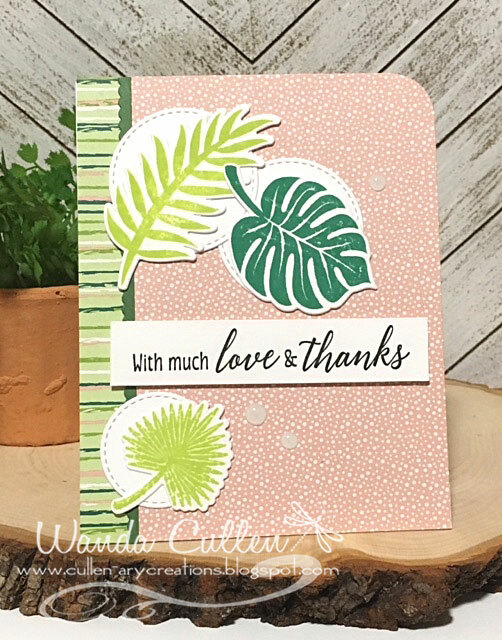 I went tropical with my theme using SU's Tropical Chic stamp set and matching dies. I'm loving their new mix of fonts! Papers are from SU's Tropical Escape 6x6 designer paper. 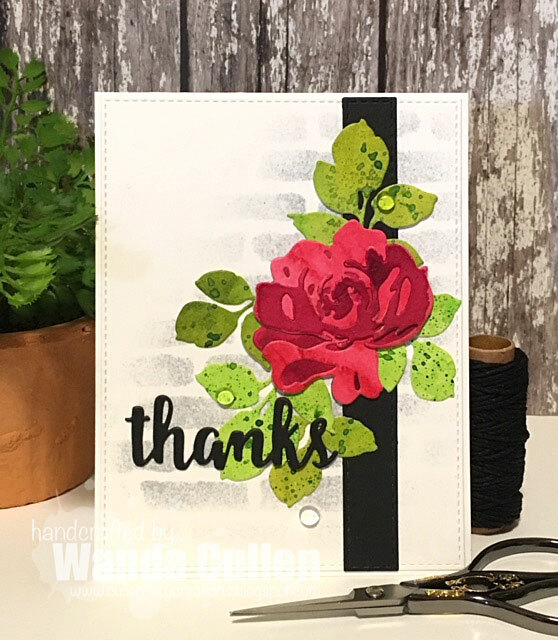 The sentiment was stamped twice using a MISTI and Versafine Onyx Black ink. INK: Twisted Citron and Lucky Clover Distress Oxide inks. 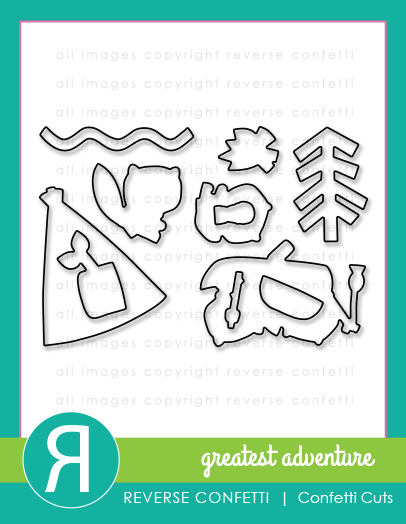 DIES: Edge Essentials (Reverse Confetti); Stitched Circle Die-Namics (My Favorite Things); Tropical Thinlits (SU). MISC: White Perfect Accents (SU); Corner Chomper. 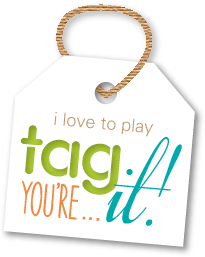 Thanks for stopping by...hope you had a restful Sunday and are ready to tackle a new week! Hi everyone! 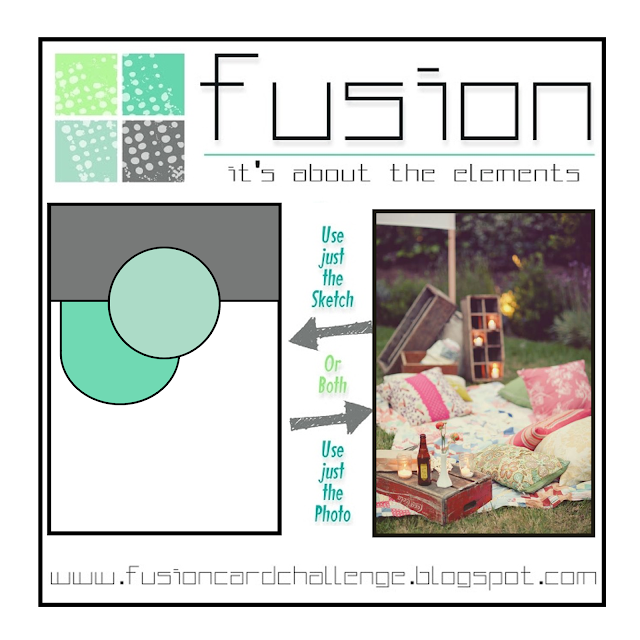 Check out this beautiful "outdoor room" inspiration photo for the new Fusion Card Challenge! 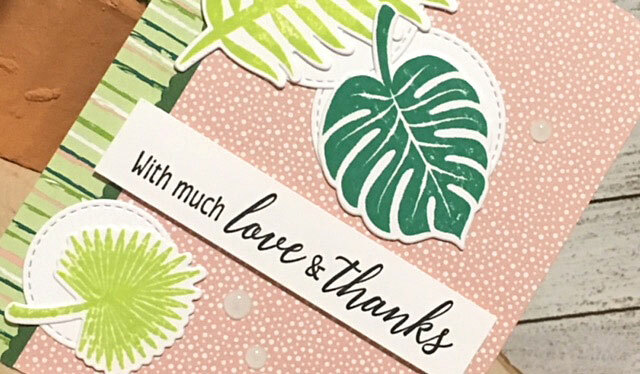 You have all kinds of elements to get your mojo going, but I was primarily inspired by the general pink and green colors and the florals (no surprise there - lol!). I also used the fun sketch. I started out with choosing the patterned papers from the 6x6" "Pretty Posy" pad designed by Linda Wood for FSC. It's hard to photograph the embossed texture and the sheen of these papers but this closeup gives a little better view. 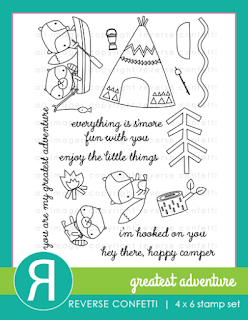 There are so many adorable critter stamp sets at Reverse Confetti, but this Bear Hugs set is one of my faves! I colored with Copics on X-Press It Blending Card then added Crystal Effects to the nose and Yellow Stickles to the flower. 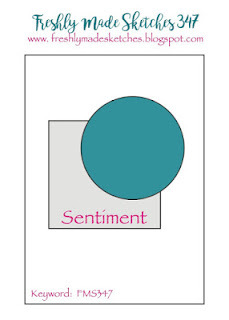 The circle frame is from RC's Circle Sentiments set. 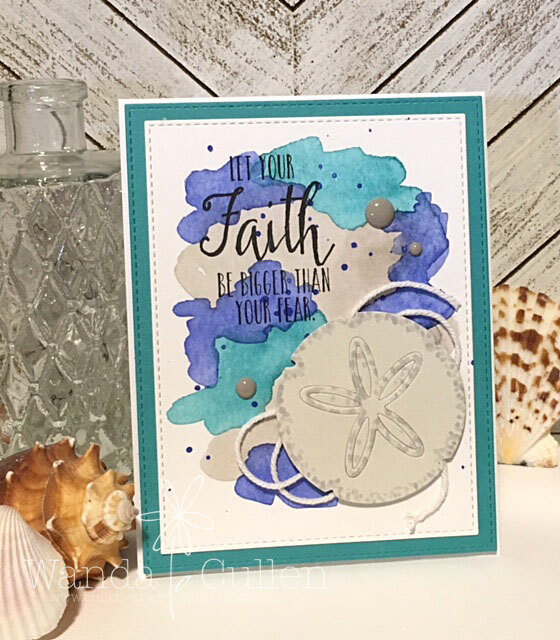 The new Color Throwdown Challenge really calls out for a sea theme to me and I knew right away I wanted to play with some distress inks for the background and use this great Reverse Confetti sentiment with the sand dollar die! Barbara is our hostess and has chosen cobalt blue, aqua, gray and white. 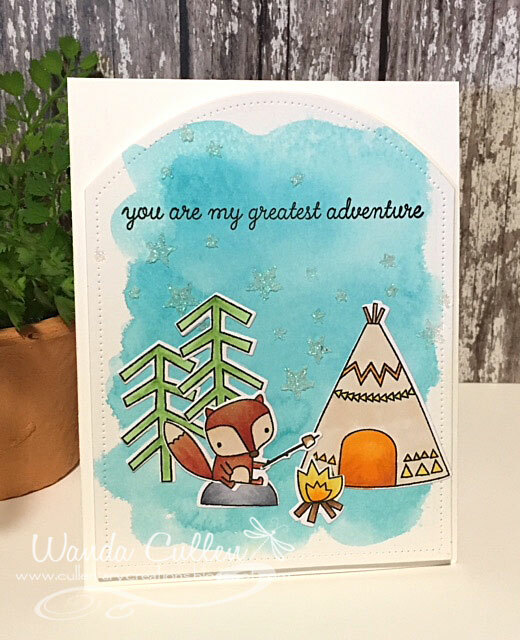 I used Blueprint Sketch, Peacock Feathers and Pumice Stone inks for the watercolor background - drying each color with a heat gun before adding the next color. I stippled a light gray Copic marker on the edges/center of the sand dollar. STAMPS: God is Good (Reverse Confetti). 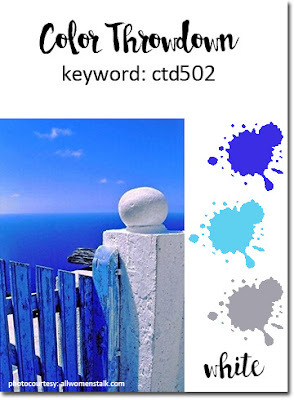 PAPER: Ranger watercolor CS; Bermuda Bay (SU); Stone (Reverse Confetti). DIES: Sand Dollar (Reverse Confetti); Stitched Rectangle Die-Namics by My Favorite Things. I'm also playing along with Just Us Girls where it's Trend Week and they've chosen one of my favorite trends: watercolor backgrounds! It's Trend Week over on the Just Us Girls challenge blog! 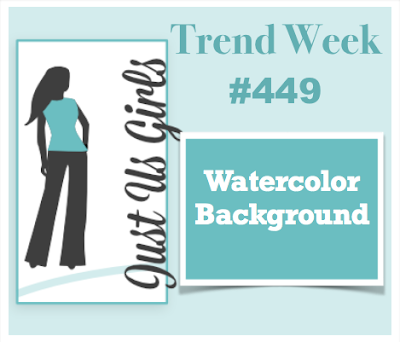 Watercolor backgrounds is the trend we are to use on a card, so this was a perfect chance to use a background I had on my leftover pile. I used Peacock Feathers distress to color the background then stenciled some stars using Nuvo glitter paste in Moonstone color. 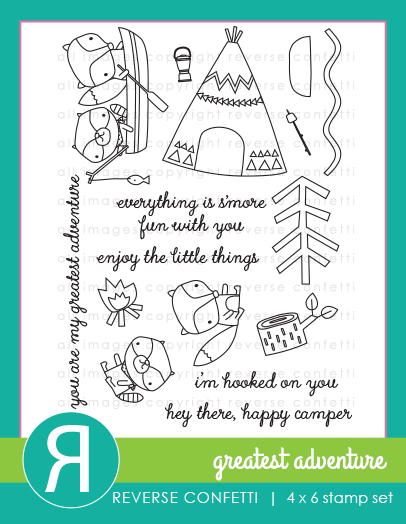 The images are from a fun stamp set called Greatest Adventure just released this month by Reverse Confetti. I used RC's Pierced Round Top Layers die then adhered the panel to the card base after layering with adhesive-backed foam. Images were colored with Copics. 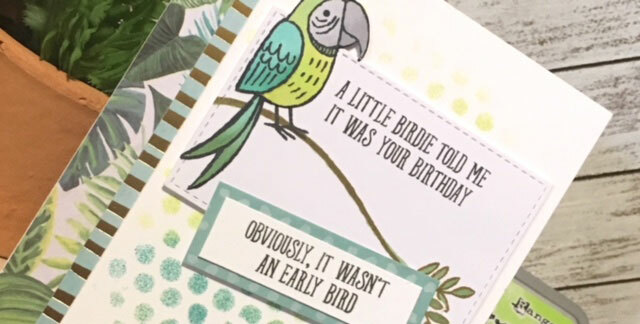 I decided to go with a new (to me) SU set called Bird Banter for a quick and easy belated birthday card for my stash. I used the sketch for the current Freshly Made Sketches Challenge. 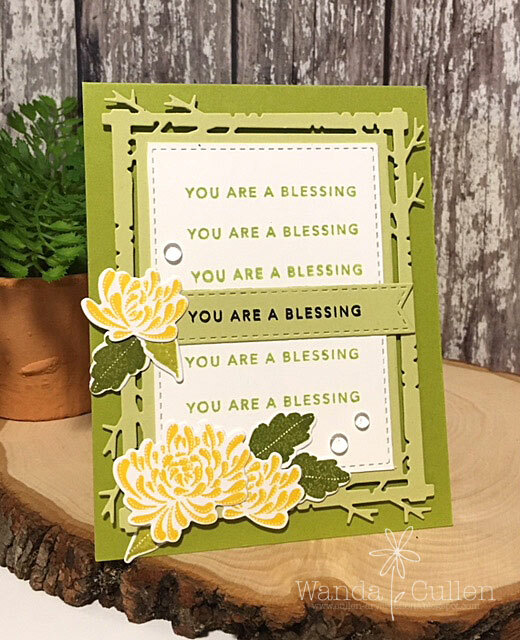 The background was sponged with Peacock Feathers and Twisted Citron distress oxide inks using Tim Holtz' Bubble stencil. 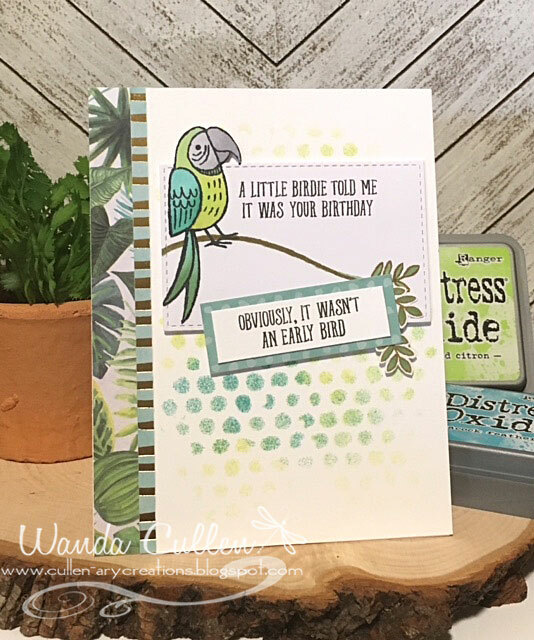 The patterned papers came from the Tropical Life 6x6 pad by Recollections. 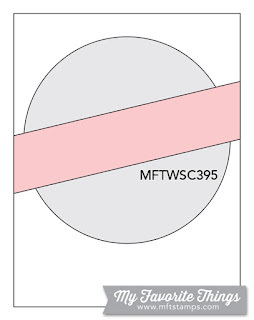 My OCD tendency is really struggling as I cannot overlook the stark whiteness of the X-Press It Blending Card panel compared to the Sweet Tooth CS (MFT) which is on the background panel. Eeekk! It really clashes!! 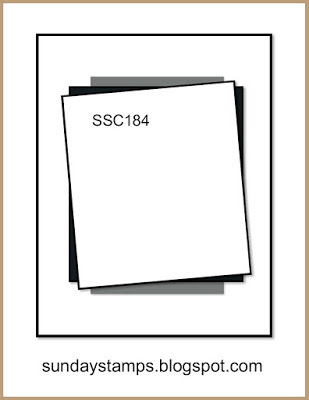 There are so many different shades of white out there and I should have known better. Anyway...I paper pieced the bird image and tucked in a couple of fussy cut leafy branches and it simply wasn't an option for doing it over. 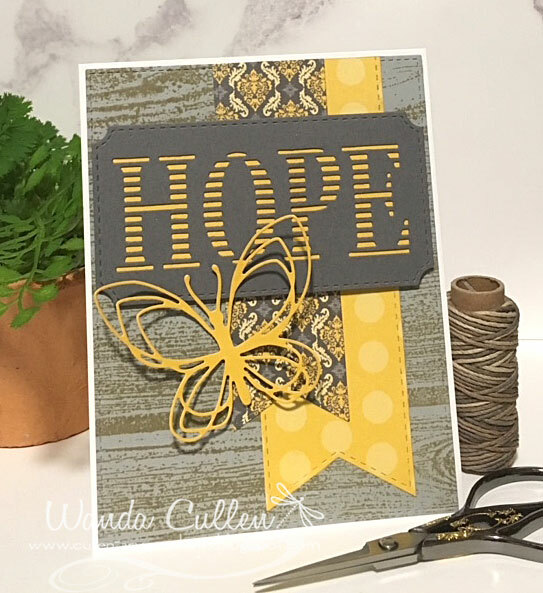 I started by stamping C9's Barnwood Background stamp with Crumb Cake ink over a light gray cardstock scrap. 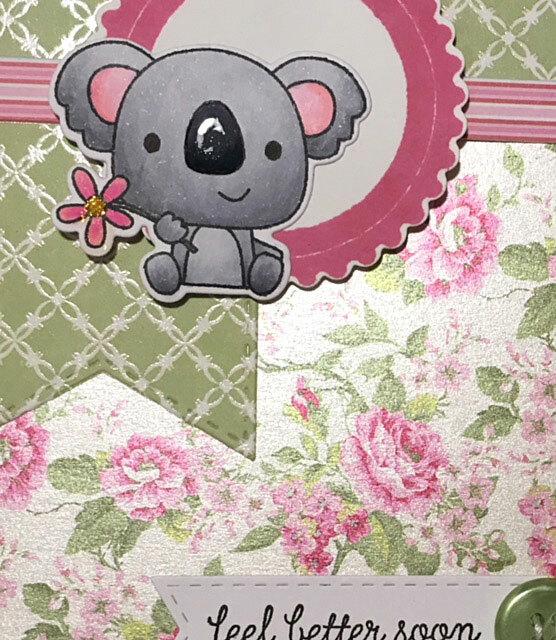 Patterned papers are from Authentique's Classique: Beauty 6x6 pad. 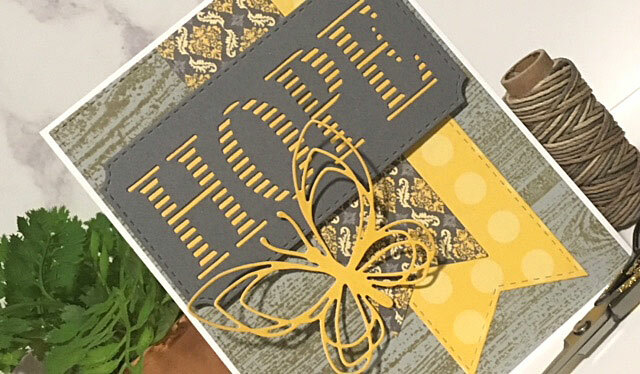 I thought a butterfly was a fitting embellishment for the theme, so used C9's Floral and Flutter Dies set. Very quick and easy design! "Whatever you do, hold on to hope. The tiniest thread will twist into an unbreakable cord. Let hope anchor you in the possibility that this is not the end of your story, that change will bring you to peaceful shores."